Early I know but I wanted to get in quickly and before the rush starts! I would normally write this post tomorrow but I am going to be rather busy then and as I currently have a window of opportunity between domestic chores figured now would be as good a time as any! 2013 has been an eventful year for me and the biggest thing has been getting back to work - more specifically, changing my career. It has been a huge cultural change and the hours I am working has come as quite a shock to the system. The biggest casualty has been time. Time to spend with the family; time to spend with friends and time to game. I should not complain - especially as at least I am coming home every night and am not away for months at a time, nor am I working anti-social hours.Don't get me wrong, I am enjoying my new career but it has taken rather a lot of getting used to. The project list for 2013 has failed spectacularly and to be honest, the list may as well be torn up and started again! The only real progress I have made has been with the block collections. I have managed to expand the collection to differentiate between troop types which will be important when I look to tackle the musket era. I have a number of ideas around this and various clues have been dropped via the blog over recent weeks. I have nothing concrete scoped out just yet but hope to shed some further light in due course. I have some painting to catch up on - the 1/2400th scale warships and a whole pile of aircraft - and had hoped to get some work in over the holiday but this has rather fallen by the wayside. The only thing I have made a lot of progress with is catching up on my reading - either via my priceless Kindle or using real books. I have a lot of hopes to realise a few games using variants of Bob Cordery's 'Itchy and Scratchy' rules and with this in mind I want to make sure that next year any projects are small, self-contained and can be resourced from my existing collection. Next year will hopefully see the Ancients getting some attention - the sequel to 300 is due in March - as I have rather a lot of 1/1200th galleys needing some TLC. This may also spawn some 16th century naval action as well as I have a hankering for some Renaissance gaming in some fashion - I have prepared a selection of Janissary blocks specially with this in mind - with the army of the Sublime Porte taking centre stage. It only remains then, for me to wish each and everyone one of you a very happy 2014 and I hope that all your respective projects and endeavours come to fruition. 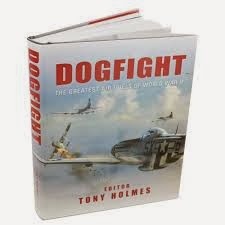 This is an Osprey compilation hardback containing five of the Duel series of WW2 fighter match ups. Crossing the Balkans on foot during the 1930s- the third part of the trilogy published after the author's death in 2011. 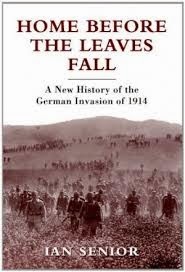 Home Before The Leaves Fall by Ian Senior (published by Osprey ISBN 978 1 84908 843 5) is a study of the German invasion of 1914 and focuses on the German and French actions during the opening weeks of World War 1 as seen from the German perspective. This is a refreshing change from the more usual accounts of the B.E.F and it is an area that I am keen to investigate further. There are plenty of supporting maps and orders of battle included so I fully expect to get a lot of block-based scenario ideas from this. My copy came courtesy of my son - via the monies he treated the 'old man' with for Christmas for the princely sum of £4.99 down from £18.99 as sold in The Works. P-40 Warhawk vs Ki-43 "Oscar"
I will enjoy this and hope that it will give me sufficient inspiration to get cracking with the painting of my Axis and Allies Angels 20 aircraft. Again, my copy came courtesy of my son for the princely sum of £6.99 down from £20.00 as sold in The Works. 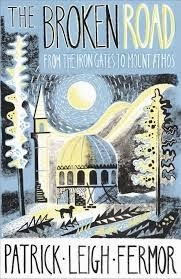 The Broken Road - From the Iron Gates to Mount Athos by Patrick Leigh Fermor (published by John Murray ISBN 978 1 84854 752 0) is the third volume of his trilogy describing how, as a young man of eighteen, the author decided to walk from the Hook of Holland to Istanbul during the 1930s. I now need to get a hold of the first two volumes! I first discovered Patrick Leigh Fermor in the book Ill Met by Moonlight written by W. Stanley Moss - the story of the kidnap of the German General Kriepe from the island of Crete during World War 2. I also discovered several large quotes from his book The Wandering Tree (about his travels in the Caribbean) mentioned in Ian Fleming's James Bond novel Live and Let Die. I am a huge fan of travel writings and so when I discovered that he had undertaken the journey culminating in the Broken Road (although as mentioned this was published posthumously) I was hooked - especially as the area he had traversed was the Balkans and Greece! All in all then I have been very fortunate this year and still have some funds to be invested although into what exactly is another matter entirely! Readers of the blog will doubtless be aware that I work in the City of London; a mere five minutes from the Bank of England in Threadneedle Street. 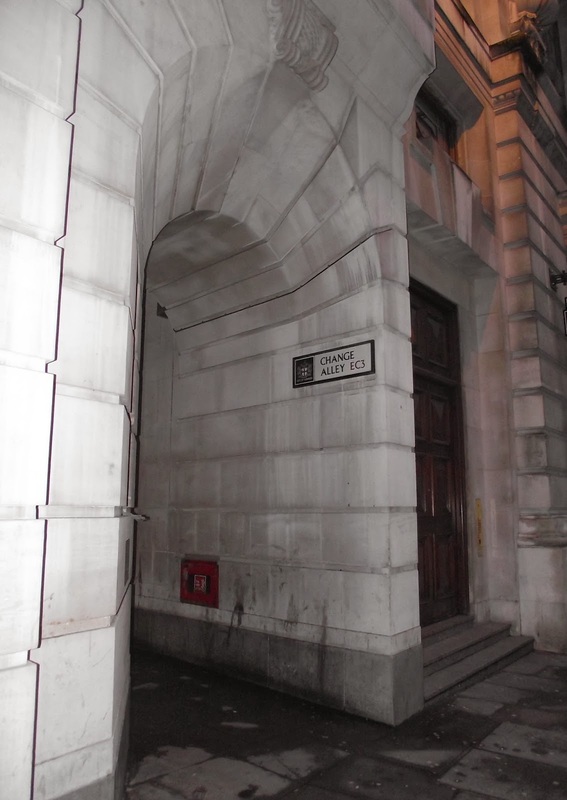 The area surrounding the 'Old Lady of Threadneedle Street' is a fascinating myriad of buildings old and new; of small alleyways and secret courtyards lost within modern and classical office buildings, shops and hostelries of every type. Of particular interest in this respect is the block between Cornhill and Lombard Street - it is full of small alleyways and with surprises appearing at almost every turn. One my personal seasonal traditions is to reread Charles Dickens book - A Christmas Carol during the week before Christmas. I have done this for many years now and always enjoy the experience; more so this year because my offices are located virtually in the heart of where most of the book was actually set - within the heart of the City of London. Whilst Dickens does not offer much in the way of actual place names in his book by virtue of some local knowledge and some 'google-fu'; together with my trusty electronic copy of A Christmas Carol, I have managed to identify a couple of places featured in his story. 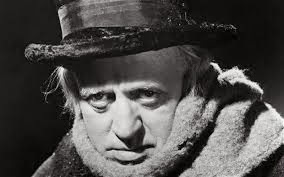 Ebeneezer Scrooge was a businessman with offices in the City of London. The actual location of 'Scrooge and Marleys' is not revealed although reference is made to him conducting business in or around the Royal Exchange as Dickens described 'Scrooge's name was good upon 'Change, for anything he chose to put his hand to.' 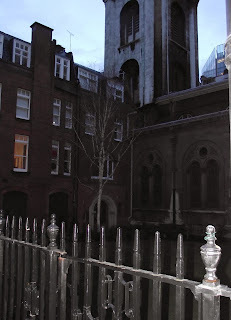 At the time of writing A Christmas Carol (1843) the present Royal Excahnge building was still under construction and was not finished until 1844, the previous building had burned down in a fire in 1838. However, across the way from Cornhill is Change Alley so did Scrooge conduct his business there perchance? 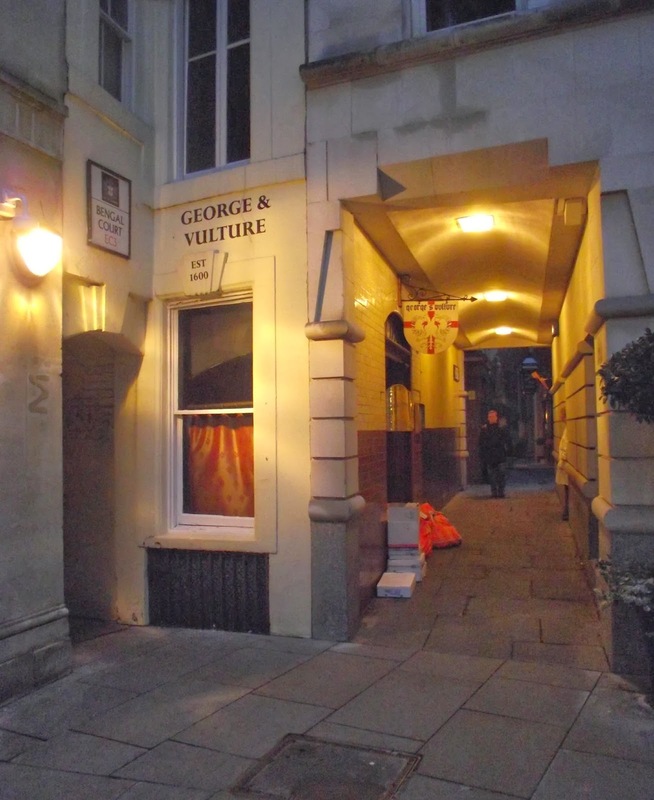 Change Alley - the site of many small businesses in Victorian times, benefiting from the building work being undertaken in the construction of the new Royal Exchange. Did Scrooge have an office in here? Of one thing we can be absolutely certain of is Cornhill, which is mentioned when Bob Cratchit, Scrooge's downtrodden clerk, 'went down a slide on Cornhill, at the end of a lane of boys, twenty times, in honour of it being Christmas Eve,' and there is indeed a slope from roughly the exit of Change Alley down to Poultry. Looking down Cornhill. 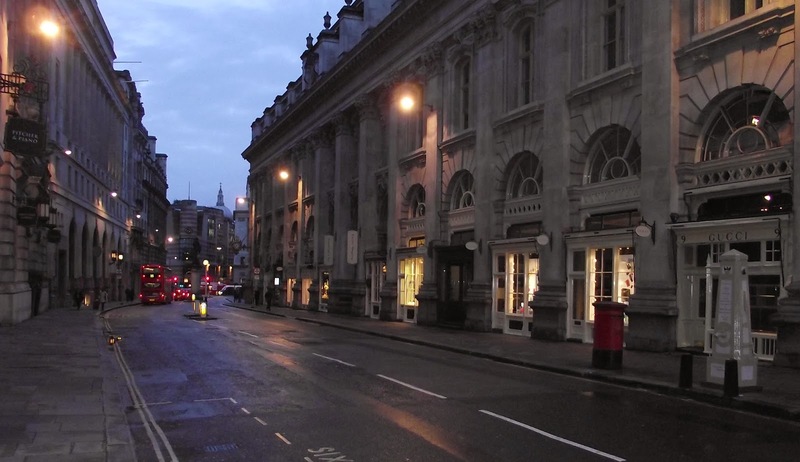 Change Alley is on the left and the right is the new Royal Exchange building completed in 1844 - the year after A Christmas Carol was published. Note the water pump on the right hand side near the post box and the dome of St Paul's Cathedral in the distance, complete with its churchyard . 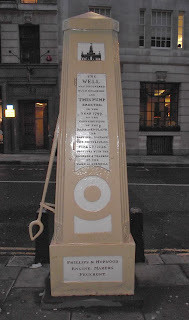 The water pump is not mentioned in the book per se but I reckon that is contributed to the slide that Bob Cratchit used as it was originally erected in 1790 for watering horses so it would not be beyond the realms of possibility that the sloops had congealed into ice and ran away down the slope towards Poultry. 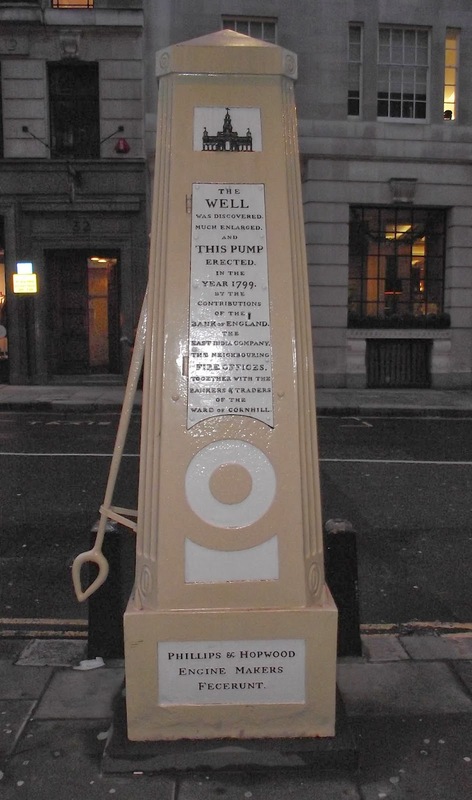 The Cornhill water pump erected in 1790. the trough was still there until quite recently although all that now remains is the two supports you can see on either side. When Scrooge left his offices to head home he stopped off and 'took his melancholy dinner in his usual melancholy tavern'. Now I have a theory about this. 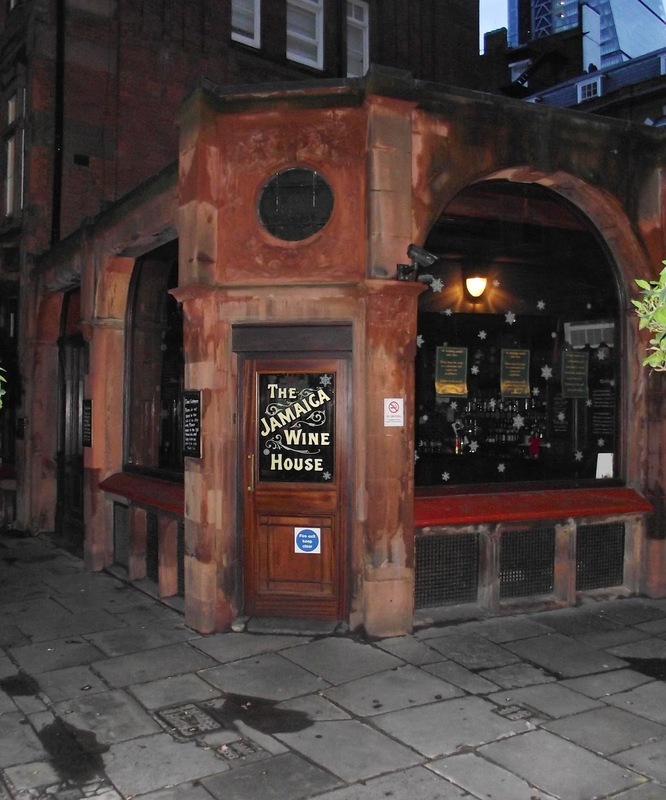 I reckon that he probably made used of either of the following two hostelries - the George and Vulture or possibly the Jamaica Wine House or the Jampot as it is known locally. 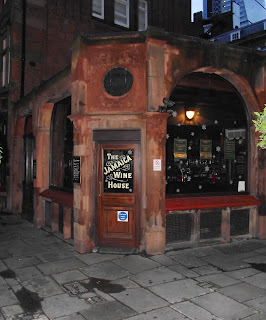 The Jamaica Wine House is certainly quite dark and melancholy on the inside as it boasts much in the way of dark wood paneling and numerous booths - just right for a solitary diner. The above venue also features in as a possibility supporting my next theory - no less than where Scrooge actually lived. In my mind's eye I see a small house tucked in a corner, surrounded by other taller buildings. Is that house in the middle of the picture that of Scrooge? With the exception of the 'Cornhill slide' much of the above is speculation and the locations described in the book could easily refer to just about any part of the city at some point. For me though, as I took these pictures this morning on Christmas Eve I could not help but think about whether or not Charles Dickens wandered around these very streets and alleyways when coming up with the idea for A Christmas Carol some 170 years ago. Something for the Christmas holiday or even during the commute to work! 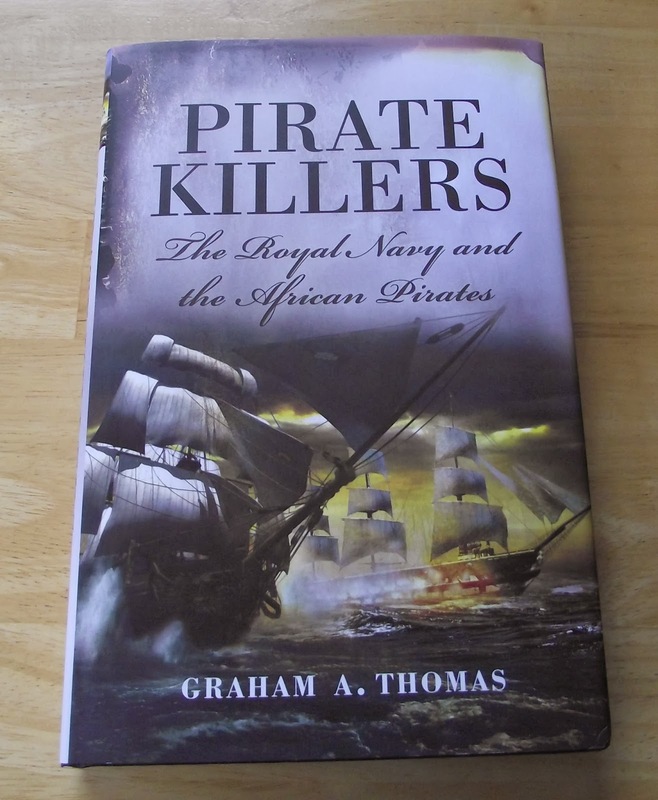 The Royal Navy have been involved in the suppression of piracy for centuries - which should come as no surprise given the importance of overseas trade to the United Kingdom. I came across the above title in our local indoor market and after a quick glance through the contents quickly decided that it would be well placed on my bookshelf! 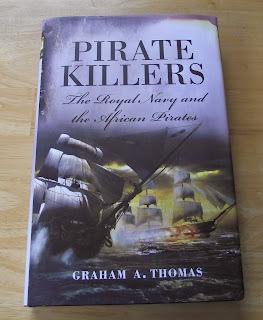 In a nutshell the book covers the operations of the Royal Navy against various of the African pirates from the time of Oliver Cromwell up until Queen Victoria and with a nod to the current situation re Somalian piratical activities. The pirates, including the infamous Barbary Corsairs preyed on shipping from all nations and usually any captives were sold into slavery or held for ransom. The situation was hampered by the fact that many of the Barbary potentates were nominally subjects of the Sublime Porte so care needed to be taken lest the wrath of the Ottoman Empire was roused. There is much potential within this title for small scale war games - either naval actions or combined arms and for me the chance to use the Barbary Corsairs in some fashion would be a temptation difficult to resist. The campaign against Algiers in 1816 by Lord Exmouth being but a single example of what the theatre has to offer. 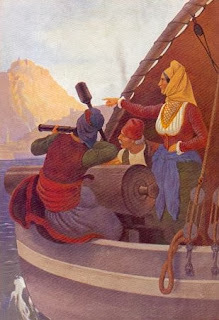 I must confess that I prefer the idea of the Barbary Corsairs rather than the more conventional Pirates of the Caribbean simply because of the whole Turkish/Moorish angle - this is really an extension of that part of the Ottoman Empire that was more or less continually at undeclared war with the Western powers for some three centuries. The French conquest of Algeria in 1830 led to a substantial reduction in piratical activities along the North African coast although it still continued to be a concern. I have a large selection of ships that could be used for actions set during the sailing navy period and the later actions featuring the campaign against the Riff during the 1850s would make a cracking mini-campaign involving landing parties and such like. I will research this in more detail and add the idea to the project list - the Barbary troops could be used for anything from 1650 to 1850 and I am thinking that in 15mm it would be easy enough to cobble together. By now I expect that most readers of this blog are aware of the fact that the actor Peter O'Toole passed away after a long illness on the Saturday just gone. He was a very fine actor appearing in both films and theatre (I really enjoyed Jeffrey Bernard is Unwell) and of course, came to world renown with his portrayal of Lawrence of Arabia in the 1962 David Lean film of the same name. The film is one of my all-time favourites and from when I first saw it on video (sadly I have never seen it on the big screen although I was lucky enough to see my other film of the era - Zulu - at a cinema in the early 1970s) was enthralled by the whole Lawrence story. At the present time I have the film itself on Blu-Ray, the extended version of Maurice Jarre's superb soundtrack album, numerous Lawrence related books, have avidly read the Seven Pillars of Wisdom and planned numerous tabletop adventures set during the Arab Revolt. The film was truly epic in scale and Peter O'Toole's performance was certainly worthy of an Oscar - he hold the record for the most nominations without actually winning one although did receive an honorary lifetime type one. Historically the film was all over the place and being described as 'based upon' is probably the most generous way to describe it - any film using Seven Pillars of Wisdom as a reference is always going to be on slightly wobbly ground - but, like Zulu, doe not in anyway detract from what was a towering cinematic achievement. As Lawrence it is fair to say that he captures visually much of the complexity of the man and his many facets. It was a thought-provoking depiction although in reality he was around a foot too tall - Lawrence was quite short. 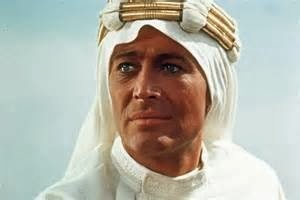 In closing I would say that the film Lawrence of Arabia, and the late, great Peter O'Toole's depiction of the man himself have been the main instigators of my lifelong interest in the Arab Revolt and have contributed, by extension to interests in many related areas. Yours truly and the officially grown up Holly - I am not ashamed to admit that I did have a bit of a wobble when I saw this picture! Yesterday, the 15th December was a day of much celebration. My darling daughter Holly reached 18 years of age. I cannot really add much to this other than to say how proud and blessed SWMBO and I have been by her and that whilst as parents you always hope your children can learn from you I can safely say that I have learned much from her in return. I also learned a valuable lesson in computers as I set up her present from SWMBO and I - a Macbook Pro - in that using Apple is so easy after Windows! 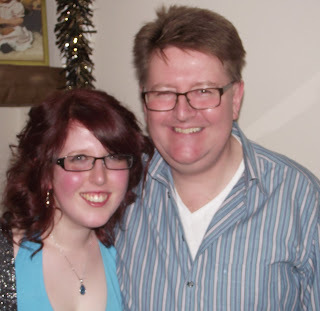 So in closing - to my beautiful, witty, intelligent, considerate Holly, a very, very happy birthday! Fezian battleships circa 1905. Nusretieh served as the fleet flagship during the pre-dreadnought era. The man cave is in dire need of a tidy up or, to be more specific, a reorganisation. It is not that it is a mess as such - more like I have another idea to make it more space efficient. All will be revealed in due course but the upshot of my 'moving-things-around-to-see-where-they might-best-fit-allowing-for-the-temporary-placement-of-the-Christmas-decorations-boxes-by-my-gaming-table' is that have made the acquaintance once again with the pre-dreadnought fleets of both Fezia and Rusland aka inspired by Turkey and Russia. Though I say so myself I was rather pleased with the way these turned out - so much so that I have revisited the partially painted battle cruisers for both the British and German fleets for WW1. The Rusland fleet - Admiral class battleships. The models that I have currently awaiting the brush are not going to be completed as they were intended i.e. 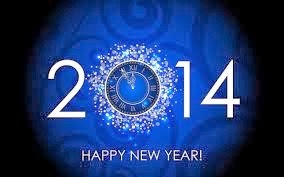 for the Royal Navy and the High Seas fleet. I have opted instead to go completely imagi-naval and complete the fleets of both Fezia and Rusland. Furthermore, I do not intend adding anything further to either fleet so they can make do with the models I have available. I have abandoned my plans to incorporate any Panzerschiffe models although I may possibly add a couple of C in C 1/2400th models in due course - just to add a little variety. I have a number of ideas around the composition of the fleets that have been described previously so I won't repeat them here but suffice it to say one side will be primarily British ships and the other will be German. Or possibly a mix of the two. Well, in the mind's eye anyway! I always find naval games to be a worthwhile diversion - a soothing balm to an overheated imagination - whilst I am beavering away on other projects - the only problem is that they then tend to take over what I was originally working on....Hmmm. The great block reorganisation has made some significant progress this weekend as the core sets for red, blue, grey and grey have been completed. It was not quite as onerous as I originally expected but was time-consuming all the same. One thing it has made me think long and hard about though is the possibility of using the block armies for earlier periods of warfare. I have previously mentioned that I have played ancient games on a number of occasions and have owned Carthaginian, Ancient Indian, Gallic, Viking and Late Imperial Roman armies over the years. At the present time I do not own any painted ancient armies - in fact, the only ancient exposure I have is a complete set of all the Command and Colours Ancients series of games by Richard Borg (as I do for most of the Napoleonics as well). Now you could be forgiven for thinking that as devoted block user having these units available via the games would be sufficient for my needs. To be honest I certainly thought so but now am not so sure. The Command and Colours blocks are really good to look at but my feeling now is that it would be more in keeping with my current usage to use blocks of my own design. Initially when I thought about this my head quickly became filled with a myriad of unit type permutations - pikes, spears, javelins, archers, swordsmen etc - which threatened to derail the entire idea or at least making it incredibly complicated. I then stepped back and thought about it rationally (which sets a rather dangerous precedent for me!). Now that I have added some distinguishing marks to the existing horse and musket blocks - the black and white stripes - I should easily be able to differentiate between troop types so, for example, I could have Roman legionaries, auxiliary infantry and assorted allies represented readily enough. The same principle could be applied to cavalry so everything from Pathian Cataphracts to Numidian light horse can also be tackled simply by designating the appropriate label as the specific type required. I must confess that my thinking was helped somewhat by referring to my copies of both DBA and HOTTs for reasons that are easy to see. As both sets of rules merge similar troop types into unit categories it makes it a lot easier to represent units using blocks - as long as they are clearly defined beforehand. This is something I will need to work out but to be honest, will be fairly straightforward to do by making use of the aforementioned different labels types and by standardising unit compositions in some way. The biggest single problem I am facing with tackling this project is how to represent formed bodies of troops are with ranged weapons. The horse and musket era assumes that all infantry types are armed with a firearm of some kind (excepting those blocks used for native types - Zulus etc) but in the earlier period having having some way of identifying separate 'shooters and fighters' is required. After thinking about this I have decided that a new label type, based on the standard infantry label, will need to be designed. This will enable units of formed shooters to be represented and, by dint of the idea I am currently pursuing, will also double for pike units during the Renaissance period where the standard infantry block can be used as per its more usual horse and musket incarnation. I realise this may seem a little on the confusing side for which I can only apologise but once the new block type is ready it will all make a lot more sense. The plan is to tackle the ancient (taken in its 1500 and earlier guise) era and also the Renaissance in some fashion - simply because the lure of the Ottoman Turks of the period is something that I am unable to resist. Following on from my previous post I have just completed reading the book you see above - a book acquired by chance at a boot sale ages ago. 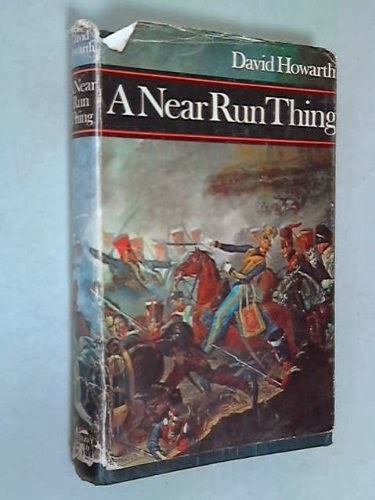 The author, David Howarth, is a particular favourite of mine for no other reason than that he had written one of the most inspirational books of my war games career - A Near Run Thing, covering the battle of Waterloo. I read this avidly back in the early 1970s and still have a copy of the same which I dip into occasionally and still be inspired by. ....and the same in 1973! 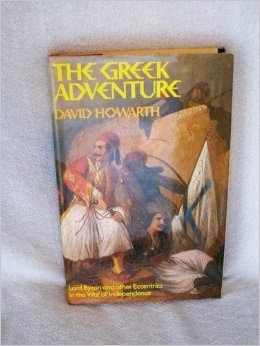 The Greek Adventure flows along in an easy fashion and like his Waterloo title does not contain any orders of battle or maps of any of the numerous sieges etc. It just reads very nicely and represents a great primer for the subject (and yes, I have a copy of David Brewster's far more serious study of the war to read next). I particularly like his personal anecdotes as he sailed around Greece interspersed with the story he was telling - it gave one a real sense of almost being there. It is not an in depth analytical study but is a cracking read and hugely entertaining - and more importantly, inspiring in many different ways. Sometimes you come across a war or campaign that appears to offer little in the way of tactical or strategic interest. Notably absent are any great examples of the art of war; no 'great captain' or crack formation of troops cross the stage of the conflict but for all that, the war or campaign still manages to inspire the gamer in some way or another. 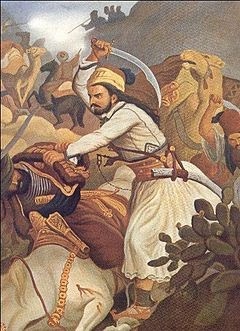 Sometimes, the idea of the conflict is more inspiring than the events in actuality - in this case I am talking about the Greek War of Independence. In a nutshell, the war consisted of gangs of brigands overcoming the bulk of the Turkish occupying forces - usually with a view more to the local situation rather than the 'national' one - and a makeshift 'navy' sailing rings around the far more powerful Turkish fleet. This was then followed by a determined Turkish response on land as the specially requested Egyptian army managed to take back pretty much all of the liberated Greek territory from the assorted rebels. By this time the great powers had taken an interest and the culmination of this was the destruction of the Turkish/Egyptian fleet at Navarino in 1827 which effectively ended the Turkish occupation. The legendary Greek female admiral - Bouboulina. She was said to have had six children and was so unattractive to look at she had to seduce men at pistol point! The Greek forces consisted of various bands of brigands - the Klephts or Armatouli - that operated across Greece and were usually more concerned with being the top dogs in their particular location and of getting one over their rivals. The idea of nationalism was very much a foreign import which the Greeks themselves were initially sceptical about. Even the foreign volunteers and adventurers were indifferently welcomed and the theatre of war led to many cases of destitution as the Greeks had little money or death by disease. Byron himself being such a victim. From such unpromising material though a number of great gaming opportunities can be explored. My opinion is that for the most part this is very much like a Colonial campaign - the North West frontier springs to mind - except with a naval dimension. I like the idea of gaming irregulars against regulars as this always makes for some interesting actions given the differing priorities and objectives of the combatants. I am planning to try a couple of actions once the remaining block armies have been completed just as an experiment but I reckon there is much potential with this war - more so than would first appear from reading about it. I made a lot of progress with the blocks although they are not quite finished. Whilst labelling and reorganising the collection I have changed the number of types by colour somewhat meaning that some additional labels had to be printed. Previously I opted to have the six colours available in identical permutations as far as unit types are concerned. This meant that for the red, blue and green set I also had various modern units - tanks, anti tank guns and infantry support weapons (machine guns and mortars) in the same way as the grey, brown and olive coloured set. I have now changed this. The brown and olive set are now mainly modern whilst the red, blue and green set are, for want of a better description, pre mechanised. The sole exception is the grey set which will feature both types. Looking at the new arrangement begs the simple question of why I did not think of this before. The new configuration should be complete over the next few days. I have just finished reading Tom Pocock's book Stopping Napoleon - War and Intrigue in the Mediterranean - and what a fascinating title it has proven to be! I had no knowledge of the various plans afoot that the British had and successively discarded in the Mediterranean - aiding Calabrian rebels in Italy, offering to assist the rebels in the Tyrol in 1809, not to mention the myriad commerce raiding type operations carried out the Royal Navy - including 'cutting out' raids. There is a whole lot of inspiration here for low level games (eminently suitable for the tabletop) and of course with a few notable characters thrown in for good measure. It has given me a few ideas and certainly some intriguing combined operations may well result - especially as I have rather a lot of ships to make use of from the Pirates of the Caribbean game.